I wanted to let you know of a delicious local BBQ this Friday, April 4 in southern Wake County. The BBQ is at the Hollands United Methodist Church, located at 9433 Ten Ten Road in Raleigh 27603. They have a BBQ twice a year and it is some of the best Q you will eat at a restaurant or fund raiser. The Q is chopped but has large chunks, with a sweet sauce that has a little zip to it. fault. All you can eat. And the desserts are also outstanding. proud to say that I have been fortunate enough to eat at a lot of the fine BBQ establishments you have enjoyed. Alabama Beats NC in BBQ and Basketball? The North Carolina tourism folks really need to get their sh*t pork together. First, South Carolina launched a statewide barbecue campaign with accompany billboards, highway maps distributed at visitor’s centers, and a slick website. As if that wasn’t bad enough, now comes word that Alabama–yes, the football state–has a NCAA basketball tournament-inspired BBQ Bracket. Alabama beating NC to the punch on a basketball tie-in for barbecue? South Carolina doing more for their highways than NC? Say it ain’t so. With all due respect to the people of Alabama–who put white sauce on their barbecue and may well bathe in it too–and to the hash-eaters of South Carolina, this shouldn’t be happening. North Carolina should be leading the way in barbecue tourism, not lagging far behind. In the immortal words of Walter Sobchak’s best friend, The Dude, “This aggression will not stand, man.” Or maybe it will. At this rate Oregon will be promoting barbecue before North Carolina does. BBQ Dragon: Bona Fide Fire Starter or Just Blowing Smoke? I recently received a free BBQ Dragon to review. Although it may sound like a prop from HBO’s Game of Thrones, the BBQ Dragon is a real product intended to help backyard cooks start their fires more quickly and with less huffing and puffing. 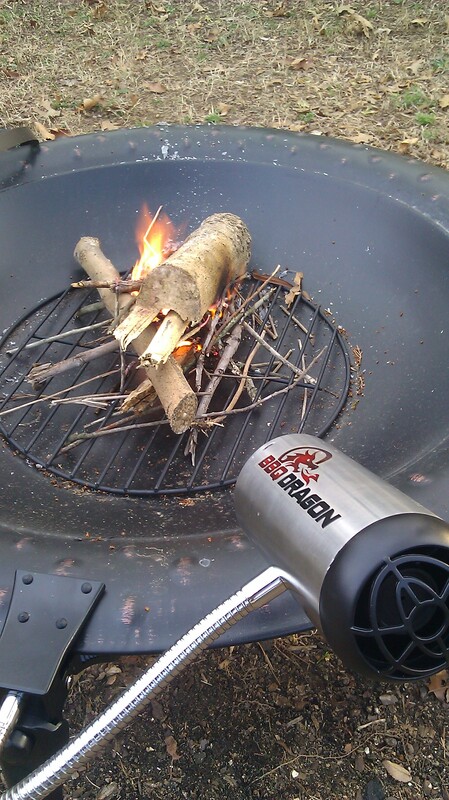 The BBQ Dragon is a small fan roughly the shape and size of a hair dryer, and attached to a sturdy, flexible stem with a clamp at the base to connect it to your fire pit, grill, or smoker. Powered by batteries, the BBQ Dragon blows air on your coals to help them catch fire faster. Straightforward, clever, and… effective or just a lot of (hot) air? According to the product’s promotional email: “BBQ Dragon takes a simple concept – adding oxygen to fire – and puts some power behind it. Why sit and blow on your charcoal, or wave dishware at it to create a breeze to supply more air? BBQ Dragon points a steady stream of fire-fueling oxygen directly onto your charcoal, so it’s grill-ready in under 10 minutes – hotter and faster than ever! Don’t leave your grilling to chance – mechanize your charcoal’s oxygen supply with BBQ Dragon!” Exclamation points abound. The website takes the hype a giant step further, calling the BBQ Dragon, “The biggest revolution in barbecue since lump charcoal.” I have to admit to being dubious of products that are pitched with such reckless abandon, but leaving my skepticism aside I put the BBQ Dragon through its paces, trying it on charcoal and on kindling and wood in a backyard fire pit (picture inset). The BBQ Dragon worked as advertised, adding oxygen to the fire without need for huffing and puffing. The flames started to roar fast and the coals/wood heated up quickly. (The trade off for the reduced burden on your lungs is a fairly noisy fan even at the lowest speed setting.) Priced at $49.99 plus shipping, the BBQ Dragon is a pricey accessory, and certainly one I’d place in the “fun but not essential” category. Still, it’s a clever idea and can help if you’re like me and your fire building skills could use an assist. Plus, if all else fails you can point it at your friends and dry their hair. By the way, it’s interesting to note that the BBQ Dragon was developed using Kickstarter funds, with a successful campaign that crowd sourced over a hundred thousand dollars. Pretty neat, if you ask me. Why didn’t I think of that? The NCBBQA Cooking School will run from 8am until 1pm & includes lunch. Bill Eason, NC barbecue legend, Alex Ranucci, 2013 Q-City BBQ Championship Grand Champion, & Kevin Kuruc, Executive Chef for Mac’s Speed Shop will demonstrate everything you must know and more about preparing, smoking, and presenting NC-style Whole Hog, Whole Pork Shoulders, & Whole Chicken. Cost for the school is only $200 & includes a two-year NCBBQA Individual or Family Membership. For current members, paid dues will be credited to the cost of the school. Cooking school spots are limited. Please contact us ASAP to reserve your seat. The NCBBQA Judges Training will run from 2pm until 5pm. You will learn the NCBBQA method for judging competitive barbecue entries & will receive top priority for judging at our upcoming competitions. Cost is only $40 & includes a two-year NCBBQA Individual Membership. We certainly hope you will join us. For questions or additional information, please contact us at ncbbqa@gmail.com or message us on our Facebook Page. Thank you for your interest in NC barbecue and NCBBQA.